I am all about salad in the warmer weather! I got so excited about salad season this year that I started a Summer Salad Series on the blog! You can read the first post here. 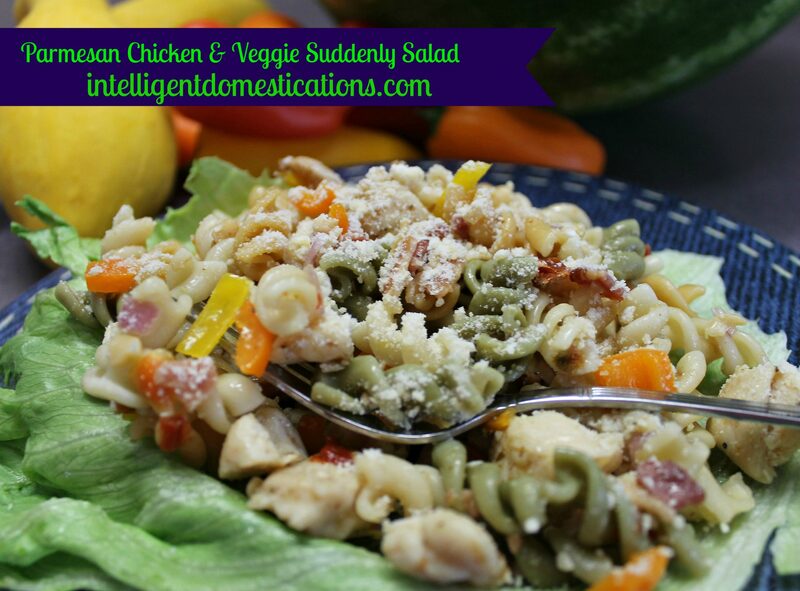 The second post in the series features Pasta Salads including Easy Fixes for boxed salad mixes. Because they are so easy to prepare, I tend to purchase a few boxes of Suddenly Salad each summer. While I am not complaining about the Suddenly Salad as prepared, they can be enhanced many different ways to personalize to your family’s taste. The recipe I am sharing is one we recently enjoyed. Spray skillet with non-stick spray. Cook chicken in prepared skillet and sprinkle with lemon pepper while cooking. Cut cooked chicken into bite size pieces. Cook and drain the bacon, crumble or chop in food chopper. Prepare Pasta according to package directions. Do not use the seasoning package. Stir all ingredients together after prepared. Pour the Italian dressing over all, stir well. Refrigerate for several hours. Serve on a bed of lettuce, sprinkle with parmesan cheese. How do you dress up a boxed salad? This sound so simple and tasty- perfect for a hot summer night! Yes, it is very easy to do! Great for summer when we don’t want to cook, don’t want much to eat and are looking for easy! I’ve made Suddenly Salad several times for LARGE summer events! I grab a bunch of boxes and line one of those big disposal roaster pans with romaine lettuce leaves, then fill ‘er up! I haven’t had Suddenly Salad in ages! You’ve reminded me to go back and give it a good try! I always liked it, but had completely forgotten about it. Pinning! I usually pick up a couple of boxes with coupons every summer. We love to dress it up with lots of yummy additions.